I write this post from above the clouds. For me, writing on planes surpasses the stereotypical writer-in-cafe; where the habit of people watching can too easily become a distraction. Admittedly, a degree of contortion is required when writing in such a tight space but its worth it, as being high above the ground in a neutral space fosters creativity. And it allows me a chance to reflect on the day. You may recall from yesterday’s post that I had given myself a quest: to find the soul of a city. After a rocky start, by the close of day I had re-embraced Melbourne’s darkness, discovered more of its soulful street art, and was reminded that home is never too far away. Today I woke to a city eclipsed by grey. Pulling back the grey curtains in my hotel room, the immediate view was grey buildings closing in on me. 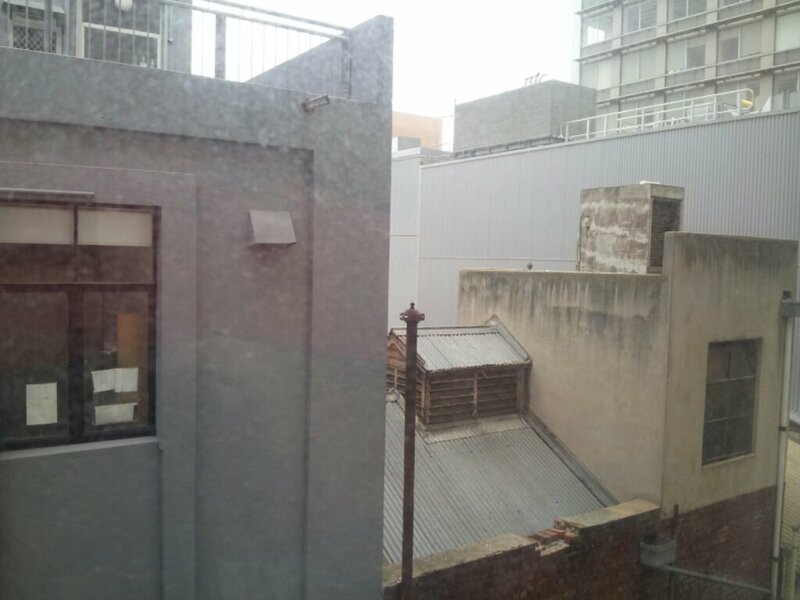 A slash of grey sky greeted me beyond this vision of unloved bricks and mortar: yet another overcast day in Melbourne. Out in the streets, consumerism had awoken from its too brief slumber; peddlers of unnecessary goods and makers of coffee had flung open their doors, boldly displaying their lures for the weary. The dark alleys and lane-ways of the night were now bursting with colour; eclectic cafes and places of fashion had sprung into life at the first sign of day. With my cabin bag rolling faithfully behind me, I once again walked the streets, heading towards the day’s meeting venue. Some hours later, work done, I had a brief moment before I needed to find my way to the airport; time enough for last-minute exploring. And then I found her: the grand old lady. On the corner of Russell and Collins, if I stood at just the right angle, ignoring that all-engulfing parasitic concrete and steel, blocking out the devouring consumerism of the CBD and the perpetual grey skies, I could see a glimpse of old Melbourne. And that view was worth all those hours of walking and searching that I had done during my brief visit. I imagined that the veils of Avalon had been pulled aside for just a moment, granting me a vision of the old city; what she would have looked like, done up in her finest, before being dwarfed by the steel of modern Melbourne. Satisfied that I had met my quest, I continued down the street and was hit with a sudden urge. After years of having a former addiction under control, I walked into a bookstore, and it felt good. Taking my treasure to the counter, a bespectacled matron of books asked me where I was heading; my bag having given me up as a traveler. I told her I was returning to Adelaide, and she visibly shuddered. Not only did she involuntarily twitch at the mention of my destination, but she let out a most impressive ‘ugh’ sound. Laughing, I assured her that we often had the same reaction to them: for akin to sibling rivalry, the mutual feelings between Melbourne-ites and Adelaide-ians has never been overly covert. On that note, I had come full circle. So I left happily with my book on modern archetypes (an antidote to my recent fiction pig-out) and Penguin ‘book’ key-ring (D.H.Lawrence’s ‘The Lost Girl’, to remind me that getting lost often leads to the best adventures); I was ready for the journey home. As the yellow taxi zoomed in and out of traffic, a thought came to me. Putting aside the soulful street-art peppered on tired old buildings, this steel-based art of the modern Melbourne appears to fit into three main categories: watcher, phallic symbol and twisted vine. With such forces creeping over the city, what hope does an old lady have? As the airport loomed closer I heard the distant sounds of waves, calling from thousands of miles away: home. So I bid the fair lady adieu….until next visit.